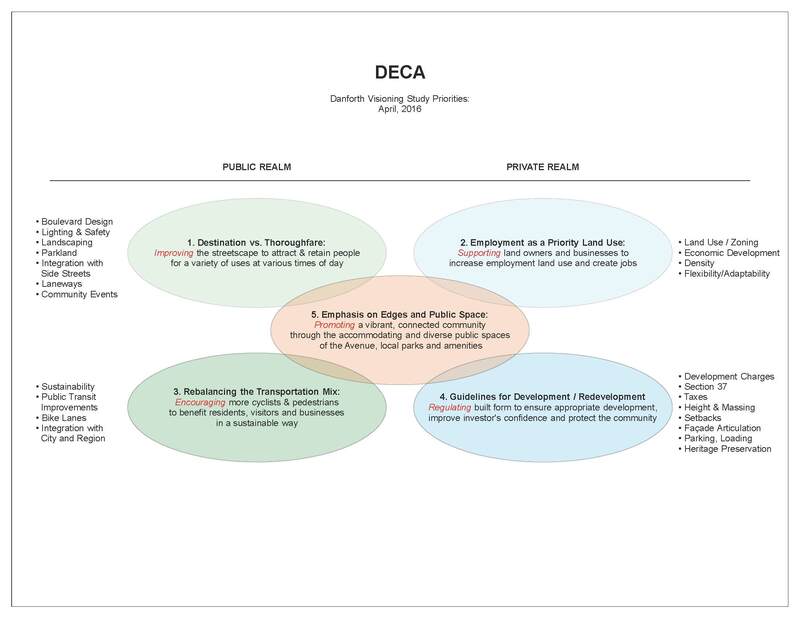 DECA Visioning Committee meets monthly to study, discuss and advocate directly on issues such as urban planning, transportation and neighbourhood economics. Some important changes are coming to our neighbourhood. Metrolinx is proposing to expand Go Train service to every 15 minutes, add a fourth track and electrify the rails. You can attend a public meeting and view information online about the Lakeshore East Corridor. If you are curious about any local urban issues or simply want to be more informed, join us! Please contact visioning@DECA.to for more information. In the latter half of the 20th-century, the vibrant nature of the Danforth suffered as the street’s destination functions – commercial, community and social – were significantly reduced while emphasis on moving cars was increased. We aim to reverse this trend in a meaningful way. The health of commercial main streets is to a large degree a reflection of the neighbourhood economy. Our neighbourhood during its decades of decline was gradually stripped of its mix of primary uses – those uses that either attract people daily from other parts of town or keep large numbers of residents here for daily needs. In functional terms, this means creating incentives to ensure that employment and institutional uses are encouraged as part of the redevelopment process. Commercial viability, public safety and a naturally fun and attractive street atmosphere requires much more foot traffic and eyes on the street than we currently have. While that will mean making a 27-metre-wide street allowance much safer and easier to cross for pedestrians and safer and more comfortable for cyclists to co-exist within, it would also require a comprehensive study of parking needs, opportunities (for basic commercial activity and proposed redevelopments) and how our subway stations can better connect with the surrounding areas. We have to find a balance that ensures development rules protect the best of our neighbourhood’s community feel while encouraging a healthy level of reinvestment interest with rules that are legally enforceable. 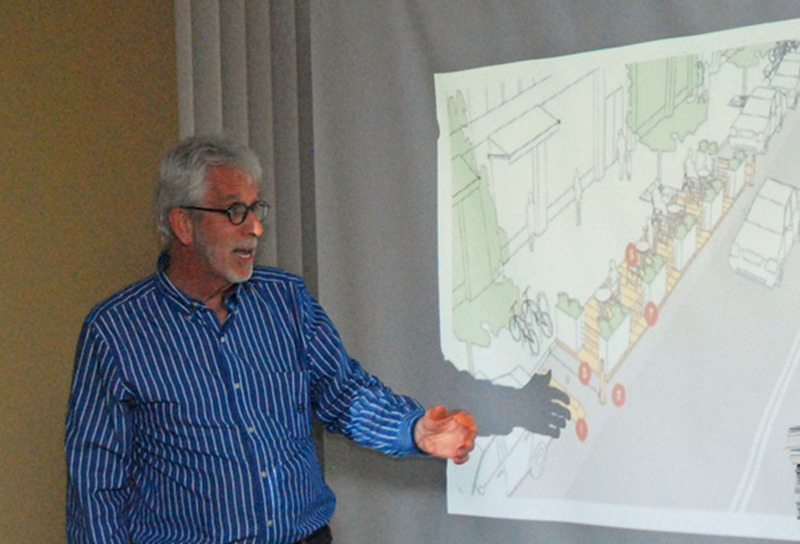 This will mean some context-specific considerations, to maintain the Danforth’s character and address unique sites, such as those adjacent to subway stations and those directly abutting residential properties. To create a year round vibrant, safe and walkable community, the public space and its contributing private edges must provide an engaging context, shelter from the elements and destinations locally for everyone from 8 – 80 years old. The existing deficit of interior community and cultural spaces, and parkland are priorities to be addressed. Questions as to whether our existing infrastucture will support growth and what needs Section 37 money will alleviate also require answers.